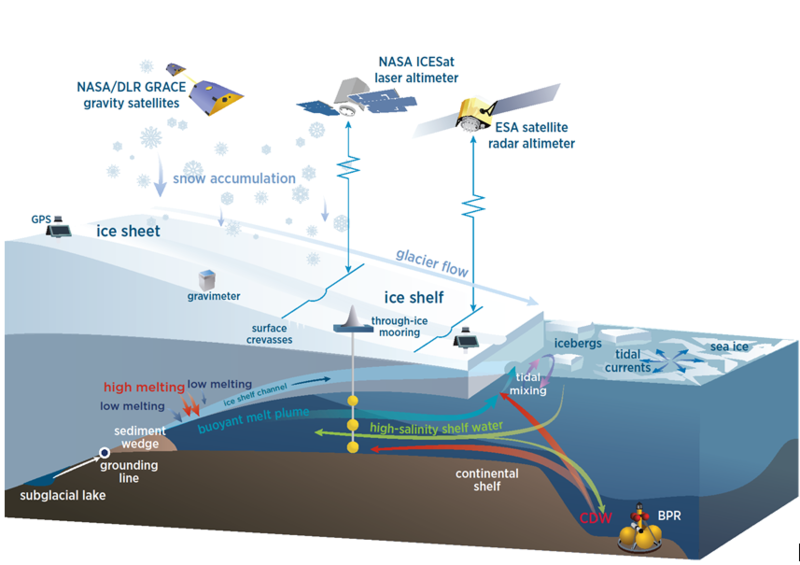 Schematic of measurement systems and ice-ocean processes at the marine margins of ice sheets. A peer-reviewed paper published on Feb 14, 2018 in Reviews of Geophysics describes the importance of tides to the motion and mass balance of the Antarctic and Greenland ice sheets. The study was led by Laurie Padman of ESR, with co-authors Matt Siegfried (Stanford) and Helen Amanda Fricker (Scripps Institution of Oceanography). The paper describes tide heights and currents are measured in these hostile environments, how they are modeled, expected changes in tides as ice sheets and floating ice shelves wax and wane, and consequences for mass loss from the ice sheets.